Wow, sorry I've been gone so long. I'll get started on these as soon as I can. Feathertail, perhaps? She's my प्रिय cat in the books. ^Sorry, I haven't read the last hope yet. Could आप explain the scene to me, या something like that? Okay! First Mothwing comes to Thunderclan and tells Jayfeather, "There's something आप need to see." And they go toward Windclan and they come to a reed stalk is a bright tail-tip of flame shooting straigh up, Mothwing tells him it's been burning for days. Hope that helps! Jayfeather and Mothwing go to the Riverclan border and see a bright tailtip of flame shooting up from the reed stalk that's been burning for days.. DRAW SCOURGE! आप know, the cat who rules bloodclan. DRAW HOLLYLEAF!!!!!!!!! PLEASE!!!!!!! Hollyleaf is my fav. character in the books!!!!! If आप already have drawn her then draw Sol, my सेकंड fav. character. Could आप draw Firestar?! Please!!! 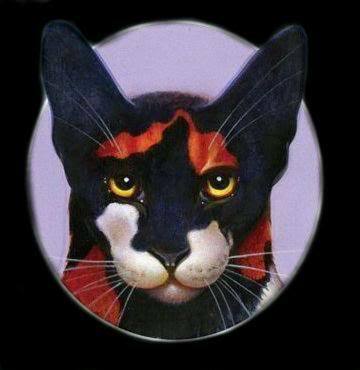 I प्यार Firestar he's my fave! He dies in the last book of the Omen of the Stars. Can आप do my OC, Silverstar (there isn't a cat already named that, right? Sorry, I'm a newbie. If there is, her name can be Lunastar.) She's light silver, and her फर glimmers off the moonlight. She has light blue eyes and wears a shining white crescent moon हार (I know necklaces are twoleg things, but I thought it'd be pretty anyway). She standing in a woods under the moon and stars. Thanks! Luna? Not for a cat, missy. 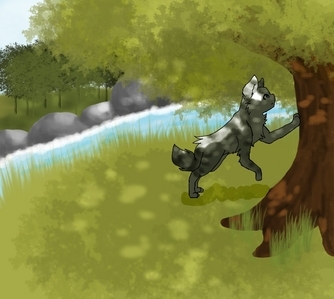 Can u draw mai character Cloverdawn and her mate Blazefur sitting on a branch of the Sky Oak plz plz plz? (Cloverdawn's a medium fluffy pale gray she-cat with dark stripes and light green eyes and Blazefur is a ginger tabby tom with light green eyes and a scar across his face and shoulder)? Sun with clear blue sky as background please.